Steam mop damaged laminate flooring, is that a possibility? Manufacturers of steam mops are pushing them for all types of flooring including laminate. You see their ads on television and it appears they are using the steam mop on laminate floors. You like what you see not thinking about what the laminate manufacturer says about steam mops. So will a steam mop damage laminate? The answer is YES! While a steam mop is great for tile, vinyl and stone floors they often result in steam mop damaged laminate floors. Laminate and excessive heat and moisture do not mix. Remember that most laminate floors are no more than a print layer of paper with a picture of wood or other design, a fiberboard core with a thin layer of melamine plastic over the paper which gives the floor some additional protection to water entering within the field of the planks face. Have ever removed stubborn wallpaper? If so you probably used steam! The print layer of your laminate floor is similar to wallpaper. While there is minimal moisture with a steam mop it is a combination of this heat and moisture causing the steam mop damaged laminate flooring. The steam dries out the laminate and in doing so the combination of the moisture and heat delaminate the pint layer from its core of the laminate flooring, just as it removes wallpaper from the wall. Steam can warp the edges and cause fissure between the planks that will allow moisture to enter the plank and cause even more steam mop damaged laminate. Unlike the original Pergo, most laminate planks today are clicked together without the use of glue. While the plank edges have been treated to protect against moisture, the combination of moisture and excessive heat will still find a way to penetrate at the joints. The result is steam mop damaged laminate. 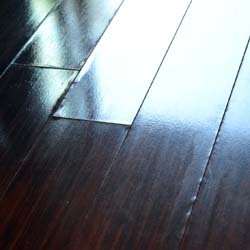 You damage your floor with water or steam and the laminate manufacturer will tell you that it is not their problem. Unfortunately the manufacturer of the steam mops will also tell you it is not their problem. Most every laminate manufacturer if not all of the laminate manufactures recommend that steam mops not be used. When it comes to warranty coverage you are at a manufactures mercy if a floor has been damaged by cleaning with steam. To play safe only clean your floors using methods recommended by the manufacturer of your laminate floor. Don’t believe what I am telling you? Take another look at the photo of steam mop damaged laminate. What about steam cleaning an area rug on top of the laminate floor. Do you have any experience with issue in that case? Only steam the area rugs on top of laminate if you want to damage he laminate. My laminate floor is 5 months old and already the floor looks smuggling and dull etc. the cleaners of our new home used a type of mop and glow that left some what of a shine, but you can see everywhere they missed and its looks bad. How can I remove the shiney blotches from the floor. What is the best thing to use when mopping and cleaning the floors? Marlene, Find out what the exact product was the cleaners used and get back with us with that information and the brand of your floor. Without the correct information we may only make more of a problem for you. With the correct information we may be able to tell you how to remove it. Some products can leave the floor with a smudged foggy appearance. Have you talked to the cleaners about straightening up the mess they left? If you can’t get the information you might try applying some distilled white vinegar to a rag and in an inconspicuous spot, see if that takes it off. If it was me, I would wait a few days to see if it worked before continuing the job. Don’t over wet and make sure the room is well ventilated so you don’t get pickled!